House Contents: written by GK (lives at Battlehorn Castle)--anything in small room by kitchen of note? Unique Dialogue: written by Vulpa (CSlist) anything regarding her services? 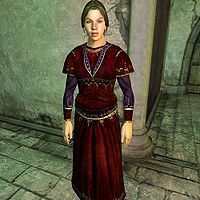 Rona Benanius is a Nord maid who serves at Battlehorn Castle. She will provide you with any wine the cellar has in stock, plus cheese, grapes, strawberries, mutton, Shepherd's Pie, venison, and sweetrolls. She will also follow you around if you ask her to. Rona wears a red velvet blouse, red velvet garment, and a pair of blue suede shoes. She also carries an apple, a bread loaf, and a small amount of gold. Rona sleeps between midnight and 6am in the small bedroom close to the kitchen. When she wakes up, she eats breakfast with Plautis Rusonius in his room for two hours. Her evening meal is also taken in Plautis' bedroom, between 10pm and midnight. For the rest of the day she will walk around the castle's master bedroom. She will follow you if asked, returning to her normal schedule once released. Occasionally, Rona will follow you to areas far from Battlehorn, especially if you fast-travel immediately after exiting the castle. Odds are she will be unseen as you walk the streets of a city, but will appear with you in some buildings before immediately turning to walk back to Battlehorn. There is a chance that Rona will pick up weapons you have displayed in your bedroom to defend herself if you attack her; you can get it back if you pickpocket her immediately, although this results in the weapon being considered stolen. She also has a tendency to "bump" into items you have on display, which may result in them falling behind furniture. If Rona sees you pick up something stolen that you have placed in your bedroom she will accuse you of theft. Even though none of these items ever belonged to her, she will still say, "How dare you steal from me!" Angering her by "stealing from her" in this way will make for a bad relationship, as she never regains lost disposition points. This page was last modified on 7 June 2014, at 22:40.